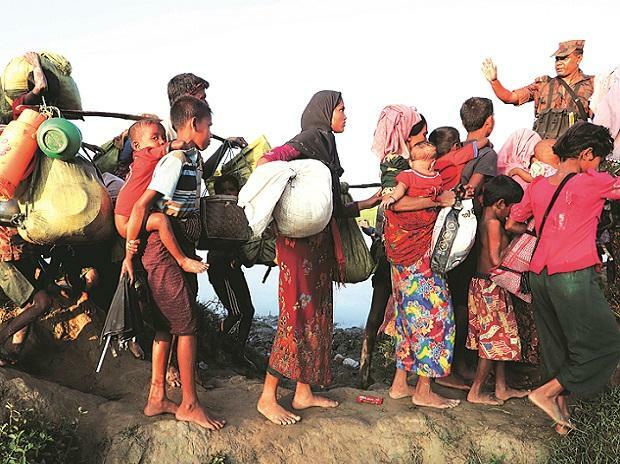 Indian police on Thursday took a Rohingya Muslim family of five to the border by bus, readying to deport them to neighbouring Myanmar as the second such group expelled in four months during a crackdown on illegal immigrants. India's Hindu nationalist government regards the Rohingya as illegal aliens and a security risk. It has ordered that tens of thousands of the community, who live in small settlements and slums, be identified and repatriated. The husband, wife and three children comprising the family set to be expelled on Thursday had been arrested and jailed in northeastern Assam state in 2014 for entering India without valid documents, police said. "These five people are now at the border gate in the adjoining Manipur state and we are waiting for Myanmar officials to hand them over formally," Bhaskar Jyoti Mahanta, Assam's additional director general of police, told Reuters. Jails in Assam held 20 more Myanmar nationals, all arrested for illegal entry, he added. But it was not immediately clear if all were Rohingya, a largely stateless Muslim minority in Buddhist-majority Myanmar. "We shall send them back to Myanmar once we get their travel permits from that country," Mahanta said. "Most of them sneaked into India in search of a livelihood." India's first deportation of seven Rohingya men to Myanmar in October sparked fears of further repatriations among those sheltering in its refugee camps, and concern that those returned faced the risk of abuse at the hands of Myanmar authorities. There has been no word on the fate of the deported men. The government estimates that 40,000 Rohingya live in India in camps across the country, including the capital, New Delhi, having arrived over the years after fleeing violence and persecution in Myanmar, which denies them citizenship. In August, a United Nations report accused the Myanmar military of committing mass killings and rapes on the Rohingya with "genocidal intent" in 2017 in an operation that drove more than 700,000 of them to flee to neighbouring Bangladesh. Myanmar has denied the charges, saying its military launched a counter-insurgency operation after attacks on security posts by Muslim militants in August last year.